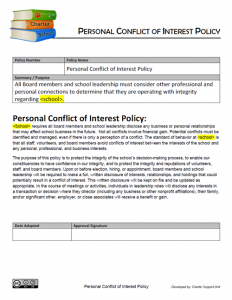 This is a sample policy that a school may wish to consider to address the need for governing board members and school administrators to disclose any personal conflict of interests which may arise in their role as a leader of the school. 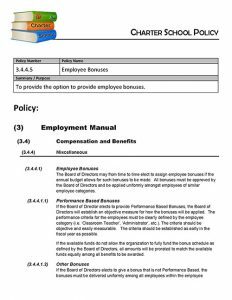 This policy is meant to provide the option to provide employee bonuses. 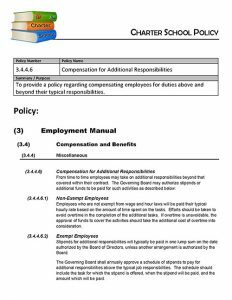 This policy is regarding compensating employees for duties above and beyond their typical responsibilities. 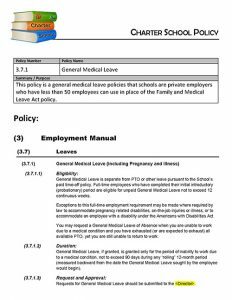 This policy is a general medical leave policies that schools are private employers who have less than 50 employees can use in place of the Family and Medical Leave Act policy. 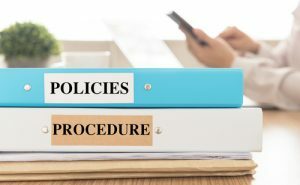 This is a sample policy to address employee complaints and how to professionally manage conflict amongst the staff, as well as the “chain of command” to use when addressing concerns in the workplace. This is a sample policy that schools can use to define the process which students should use when they need to solve a problem they are having with someone else at the school, including the proper “chain of command” and including language regarding conflict resolution processes. 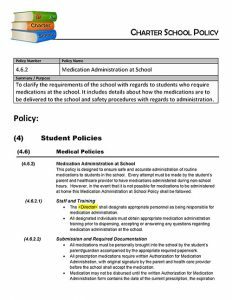 This policy is meant to to clarify the requirements of the school with regards to students who require medications at the school. It includes details about how the medications are to be delivered to the school and safety procedures with regards to administration. 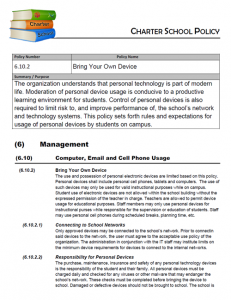 This policy revision provides a framework for schools who want to allow electronic device for educational purposes put enact rules regarding the use of the devices, and the device’s connection to the school’s network. 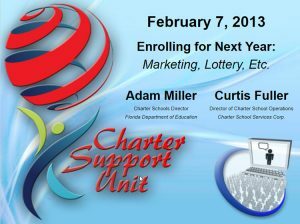 This policy provides schools with a sample acceptable use policy for schools network and technology use. 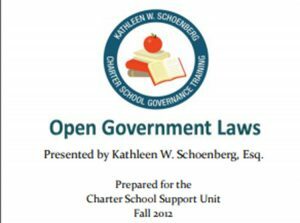 Also provides consequences for the misuse of school owned networks or hardware. This sample policy updates a former policy that was in the CSU policy manual regarding conflict resolution. 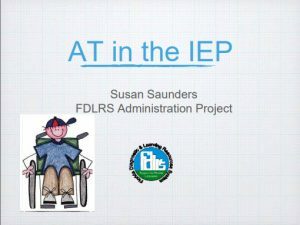 This adds additional language regarding escalating concerns when they happen and the possible chain of command that people can use when issues arise at the school. 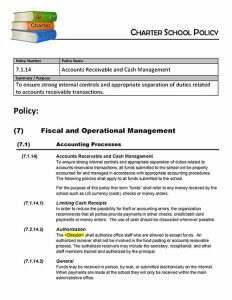 This policy is to ensure strong internal controls and appropriate separation of duties related to accounts receivable transactions. 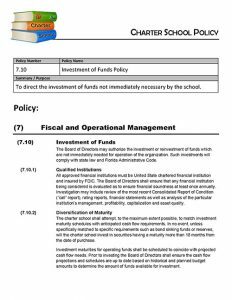 Policy to direct the investment of funds not immediately necessary by the school. 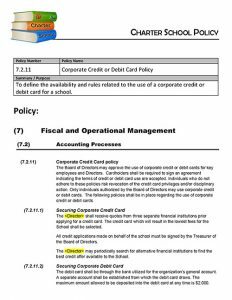 To define the availability and rules related to the use of a corporate credit or debit card for a school. 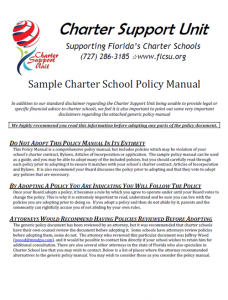 Florida statute and administrative rule provide guidelines for declaring a deteriorating financial condition among charter schools. 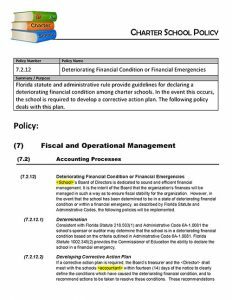 In the event this occurs, the school is required to develop a corrective action plan. The following policy deals with this plan. 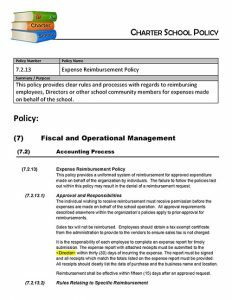 This policy provides clear rules and processes with regards to reimbursing employees, Directors or other school community members for expenses made on behalf of the school. 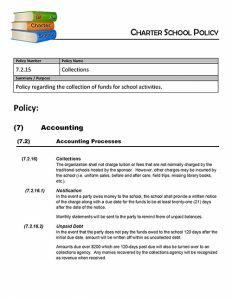 Policy regarding the collection of funds for school activities. 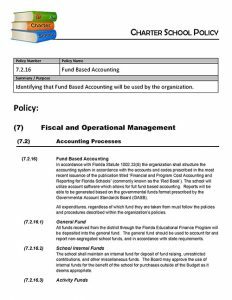 This policy is meant to identify Fund Based Accounting which will be used by the organization.